BLOOMING GROVE — Dawn Bader likes the peace and quiet of country living. Residing the past 24 years at the intersection of State Route 97 and County Road 20 in Blooming Grove, the housewife has gotten her wish. The unincorporated village once bustled with activity, like many smaller rural communities, a century or more ago. Most famous for being the birthplace of future President Warren G. Harding on Nov. 2, 1865, the burg is nestled in the northeast corner of Morrow County, just inside the Richland County border and not far from the Crawford County line. Some residents carry a Galion mailing address. It once housed, according to an 1857 map, a post office along with several churches, two hotels, two blacksmith shops and a pair of doctors’ offices. “The post office was right across the road,” Bader said pointing from her yard. “This is still a high-traffic area because of Clear Fork (only about 5 miles to the east) and people driving there,” she said. History shows it was that way 150 years ago, as the “scenic highway” took travelers from Galion to Lexington. Bader said few young people reside there now; and a neighbor named Mary, who passed away recently, may have been its oldest resident. At one time a tailor shop, cabinet shop and a wagon shop stood in Blooming Grove. Two churches remain — the two-story brick Seventh-Day Adventist Church north of 97 and the Blooming Grove United Methodist Church south of the busy highway. The Seventh-Day Adventist Church is a former town hall building that was leased by Harding’s heirs to that group in 1933. 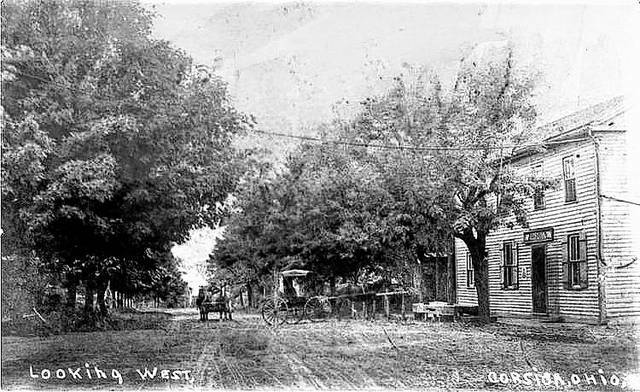 The town, according to historical records, was laid out in the spring of 1835 by its proprietor, Solomon Harding. Harding also donated land for the town’s cemetery, which remains today, on hilly terrain with a picturesque view facing north. Several hundred tombstones dot the landscape, some dating back to 1850 and others quite recently placed. “It’s pretty quiet around here,” Bader said as she prepared to paint her house. “But, there is more traffic now … and more people are building houses outside of the town,” she said. She mentioned several farming families and a neighbor who has a septic tank business who have lived there a while. There were a number of one-room schools in the early days — Blooming Grove, Center, Dewey, Flowers (or Moyer), Half Acre, Harbison, Possum Hollow and Self. In 1961 Northmor School District was formed by merging Iberia and Johnsville schools. Faith Creswell suggested the name Northmor for Northern Morrow County. A new high school building opened two years later. As with many early settlements, the post office had a different name than the town. Barcelona Post Office was established in 1844, three miles south of Blooming Grove. It was moved into town a few years later and renamed Corsica. It closed in 1912. As a result, birth records show the future president was born in Corsica. Near that site, on a utility pole, sits what is left of a fire notification box, according to Bader. It is small, rusted and barely noticeable from the roadway. A book bearing the town’s name became famous when it was published nearly a half-century ago. “The Shadow of Blooming Grove: Warren G. Harding in His Times” is Francis Russell’s 1968 biography of the 29th president. The book is probably best known for controversy generated prior to its publication resulting from Russell’s discovery of a cache of letters between Harding and one of his mistresses. “An Indian relic in the form of a fine banner stone of mottled granite was found by I. O. Harding on the farm near Blooming Grove where President Harding was born. The stone was highly polished and had a hole through it from end to end. “An old Indian trail passed over the Harding place, which evidently was a shipping place for the redskins as there was a spring of clear water around which many relics have been found. The relic has been acquired by F. P Hills of Delaware and added to his collection,” reported The Morrow County Independent. Because of its crossroads location, residents of Blooming Grove travel to Galion, Mount Gilead or Mansfield to work. Bader said at one time she looked into trying to get a dollar store to locate there. An exception to that, she mentioned, was The Presidential Inn Bed & Breakfast, a renovated 1917 schoolhouse located on the farm of President Warren G. Harding’s birthplace on State Route 97. It opened in 1996, but is now closed. A neighbor says “quite a few people” stop to take photographs of the Ohio historical marker that sits in front of an American flag, a smaller marker and a wreath, although those are located one house east of the actual birthplace. Others driving to Clear Fork Reservoir to fish or boat or going to the mall in Ontario may not realize the significance of passing through Blooming Grove. That suits Bader just fine. “I love it here. It’s peaceful. Nobody bothers you,” she said. 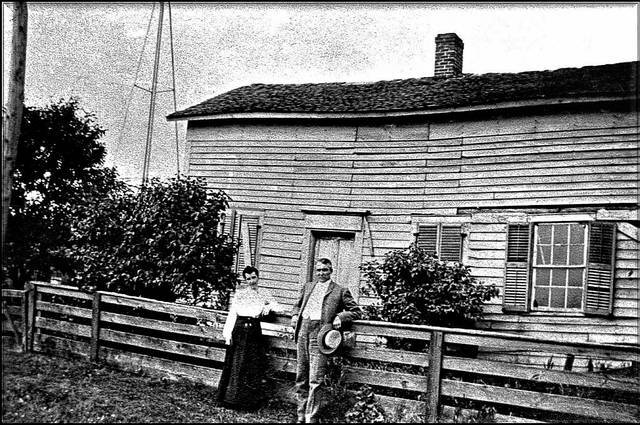 Harding with mom Phoebe Dickerson Harding at the old homestead. 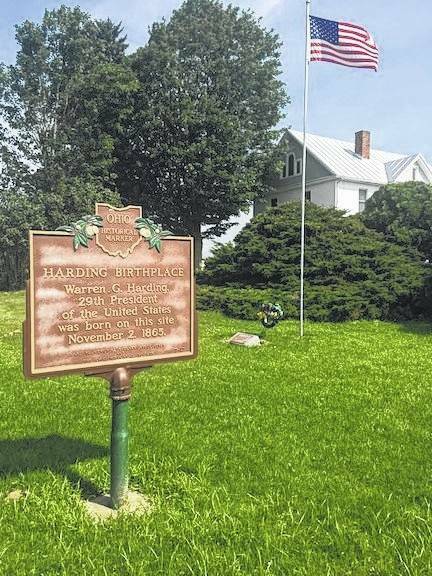 A marker depicts the birthplace of Warren G. Harding near Blooming Grove in Morrow County. Reach Conchel at 419-946-3010, extension 1806.